This paper presents a minimalistic robot for playing interactive ball games with human players. It is designed with a realistic entertainment application in mind, being safe, flexible, reasonably cheap, and reactive. This is achieved by a clever, minimalistic robot design with a 2 DOF roll tilt unit that moves a bat with a spherical head. The robot perceives its environment through a stereo camera system using a circle detector and a multiple hypothesis tracker. The vision system does not require a specific ball color or background structure. 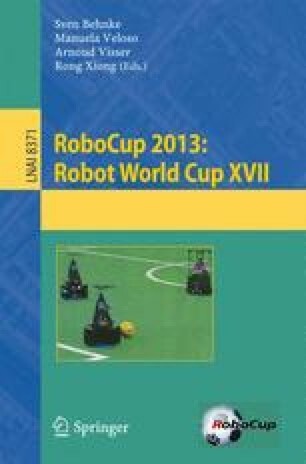 The paper motivates the proposed robot design with respect to the above mentioned requirements, describes our solution to the tracking, calibration, and control issues involved and presents indoor and outdoor experiments where the robot bats balls tossed by different players.